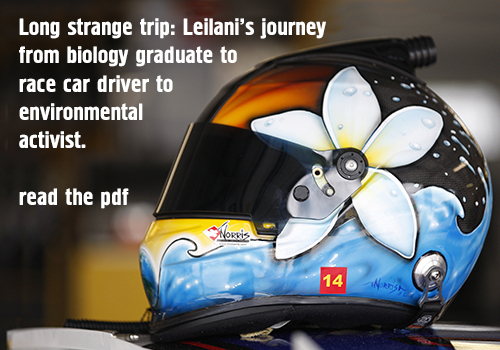 leilani.green - never underestimate a vegan hippie chick with a race car. For all the latest articles and media coverage, please visit our press page which is updated regularly. “I’m so tired,” she said, through tears, moments after she climbed from the No. 55 What The Health Toyota, to an ovation by a literal circle of friends surrounding her car. With a variety of usually green sponsors – her brother-in-law is, after all, Bob Weir, a member of the Grateful Dead – Münter came back each year, answering the bell, as tough as the 100-1 fighter who just wouldn’t stay down. NASCAR Race Hub "Women in Wheels"
Dec 2, 2015 Leilani has teamed up with the Academy Award winning team who brought you The Cove on their next documentary Racing Extinction which premiered globally on Discovery Channel in December 2015. Watch the trailer or you can rent or buy the film here.